Some 21 Sisters of Charity gathered on April 2 for Sunday Mass at St John’s Church (left), Clifton Hill, celebrated by parish priest, Fr Peter Hoang sdb, and Fr Kellie Kam sdb. The occasion? The Sisters, who have lived and ministered in the parish since 1894, were being formally farewelled from Clifton Hill. During his homily, Fr Hoang thanked the Sisters for the great contribution they have made for more that 120 years to the life and work of the parish and school communities. It was an opportunity for some of the Sisters to take part in liturgy. Sr Eileen Thynne, a past Principal, along with Gabrielle McMullen, a parishioner and a trustee of Mary Aikenhead Ministries shared the readings. Srs Judith Christy and Jeannie Johnston, both past pupils of St John’s, offered the gifts on behalf of the congregation in the offertory procession. Sr Joan Stapleton was a Communion minister. In the presentation before the final blessing, Jennifer Jacobs-Vandegreer (the liturgy co-ordinator) thanked the Sisters and made a presentation to the Congregational Leader, Sr Clare Nolan. A presentation was also made to Sr Joan Stapleton, the last Sister of Charity to be involved in the parish. Jennifer spoke dearly of Srs Dorothy Maher and Joan’s contribution and assured the Sisters that though their formal presence had gone, the parish and school communities look forward to carrying on the work and tradition of the Sisters of Charity. Daniel Ryan, the school principal spoke on behalf of the school community and made a presentation to Sr Clare. “In 1894, at the invitation of Fr Collins, the parish priest, the Sisters of Charity became the administrators of St John’s School. Four Sisters were appointed to teach at the school. They lived at the Convent in Victoria Parade, Fitzroy and travelled to St Johns by tram or walking. Sr Mary Francis McGrath was the first Principal of St Johns and Sr Pauline Nicholson the last. Sisters of Charity served as Principals from 1894 to 1990,” Sr Clare said. In October, 1923 the parish priest proposed an agreement to find housing for ten Sisters including furnishings so the Sisters had no need to fundraise. On December 5, 1923 Sr Mary Berchman’s Daly responded gladly to the offer and offered 12 Sisters of Charity to teach in the School, a rectress who would supervise School and Convent and was free from teaching. Two Sisters would teach music and one Sister provided domestic help – a domestic Sister. “In 1924 the Sisters took up residence at 12 North Terrace, a two-storey house, not far from here, purchased for the Parish by Fr May, parish priest. At this stage, nine Sisters taught in the School,” Sr Clare continued. But times and needs moved on. “By May 2003, there were only two Sisters at North Terrace and plans were being made to move to 88 Rowe St that had been bequeathed to the Sisters of Charity by the O’Donnell sisters who were parishioners of St Johns. The Sisters took up Residence at Rowe St in May 2004,” said Sr Clare. She then looked to the future: “Now it is time to move forward. We, the Congregation of the Sisters of Charity can look back and see great achievement and growth, but not without being surrounded by Priests, other Religious and people who supported us and encouraged us in our ministry of Education. For the final blessing during Mass, Fr Peter invited all the Sisters present to join him in the sanctuary. After Mass, the congregation processed over to the Aikenhead Wing for lunch prepared by members of the parish and school communities. Just before Fr Peter said Grace, he thanked the Sisters once again and made a presentation to Sr Clare. 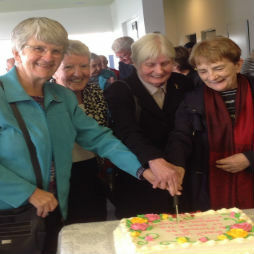 Srs Clare, Jeannie Johnston, Judith Christy, and Joan Stapleton cut the cake (right). The morning was a wonderful tribute to all the Sisters, especially those who lived and ministered in the Parish during the past 123 years.